Fotos - illustrasjoner Svært mange kart, strek-ill, tab. Atlaset som er i stort format og farger viser resultatet av finsk ringmerking siden starten med tabeller over antall ringmerkede, gjenfunnskart, dødsårsaker og tekst forklaringer. Hovedtekst på finsk, men sammendrag og tabell- og figurtekster på engelsk. In Finland, ringing of birds was initiated 100 years ago, in 1913. Since then, almost 10.4 million birds have been ringed with more than 1.1 million later encounters. The data hosted by the Finnish Ringing Centre have been used for conservation and research purposes. Among other things, ringing provides information on migration routes, wintering areas, causes of death and site fidelity of birds. The aim of The Finnish Ringing Atlas is to thank and motivate voluntary ringers, give research ideas for scientists and provide authorities and members of the public with information of movements of birds. This first of the two volumes gives an introduction to the history of ringing, illustrates temporal changes in numbers of birds ringed and encountered and also briefly describes other marking techniques. Species-specific part of the volume 1 includes the orders from Anseriformes to Charadriiformes (waterfowl, grouse, divers, grebes, herons, birds of prey, crakes, waders and skuas). The second volume includes the rest of species accounts and tells us, among other things, about scientific research conducted on the Finnish ringing data and about ringing at bird observatories. 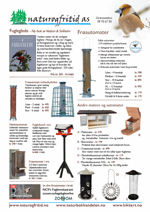 The Finnish Ringing Atlas has been funded by the Kone Foundation and the Ministry of Environment.